Fig 4 Correct Paper Path? that chip, so they are different s/n. 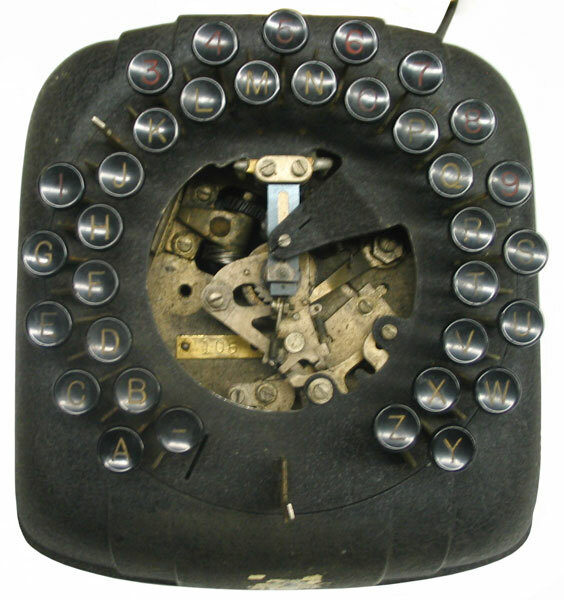 Also known as the Teletype Model 36. I've been told that these were used inside factories ( located on the same power gird as the transmitter) for internal communications. They work using a type wheel (missing from this one - If you have one or know about them please let me know). The name comes from the idea that a single pulse defines each character, rather than using 5 or more pulses for each character. The width of the pulse determines which character gets printed. The key to this type of system is getting the transmitter and receiver synchronized. within a limited radius and have access to the same 115 volt 60 cycle power source. Monopulse equipment is not adapted for operation with other Teletype apparatus, and because of this and other limitations is recommended for local message service only. 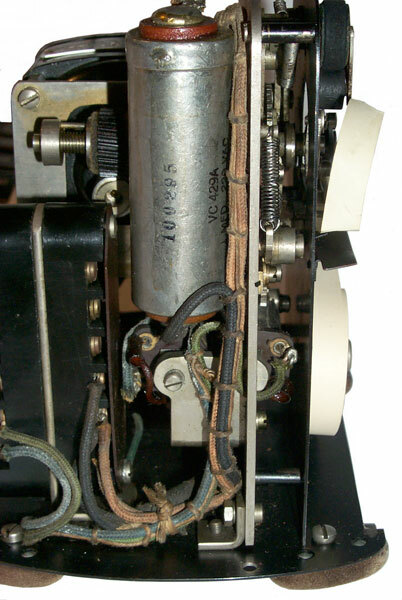 For general communications service over extended circuits see Teletype Model 14 and Model 15 printers. If you are used to TTY machines, this is much smaller! It's 6" wide, 5" deep and 6" tall. Weighs 7.5 pounds, but the line filter (or similar component is missing) maybe 8 pounds total. Width: 3/8" core I.D. 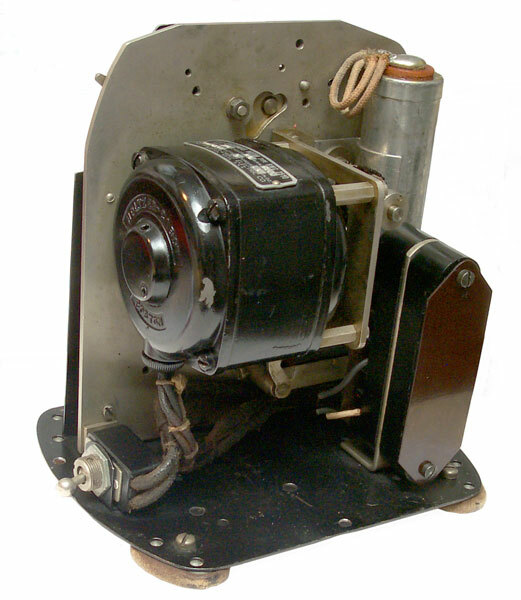 : 7/16"
A.C. Synchronous Motor, Type RWC 2510, Volts: 110, Cycles: 60, R.P.M. 1800. No. 1015237, Watts: 9, Torque: 0.3 In. 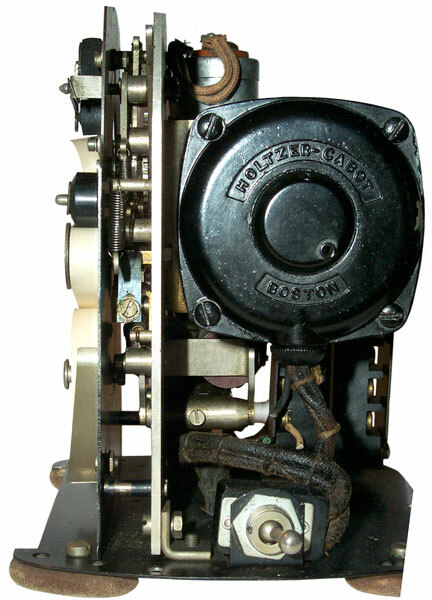 Oz., The Holtzer-Cabot Electric Co., Boston, Mass, U.S.A. 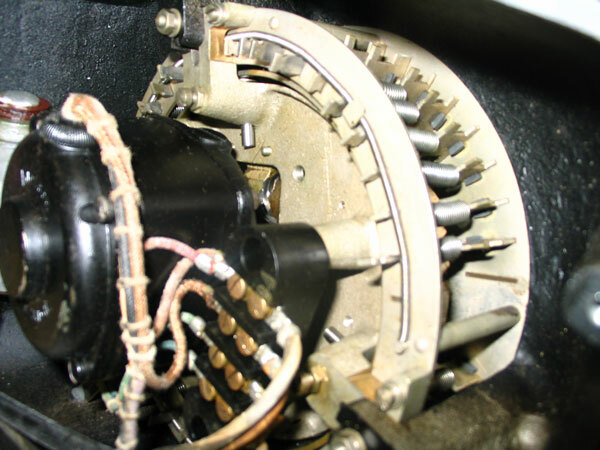 The worm gear reduces the speed by 15X i.e. 1800 RPM / 15 = 120 RPM or 8.333 ms per character. Mounts using two screws about 9/16" c-c. The hole in the panel behind the type wheel is 1.45" dia. There is a print hammer under the paper tape that snaps up to print the character. 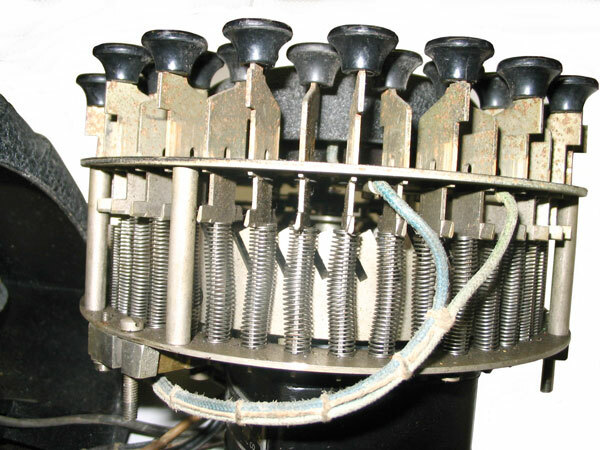 There is a solenoid on the back side related to driving the print hammer. Most likely an A.C. power line filter, see Electrical below. If you know what's missing please let me know. The rear terminal strip is NOT connected to the front terminal strip. The missing component may be a power line filter?? Only the bottom two terminals are used. 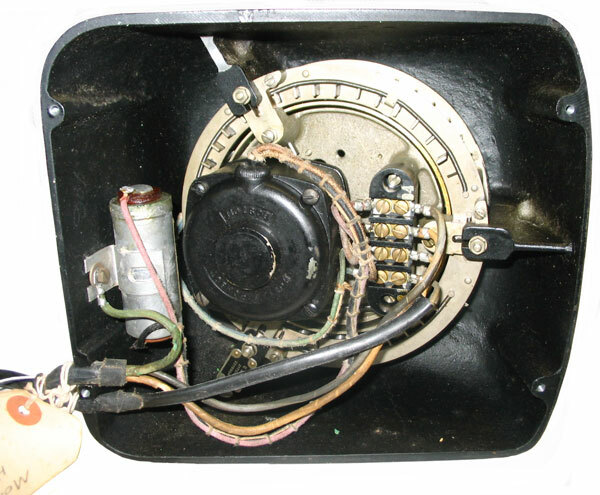 They go to the solenoid which has it's two coils wired in series. Resistance is 204 Ohms. 20 Volts (100 ma) will operate the solenoid. "203. 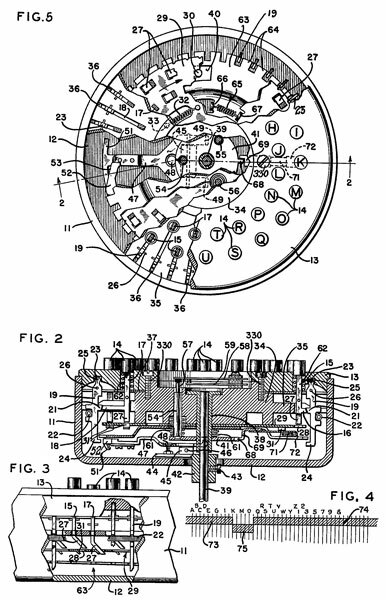 There was always the push to develop lower cost units for simpler systems. 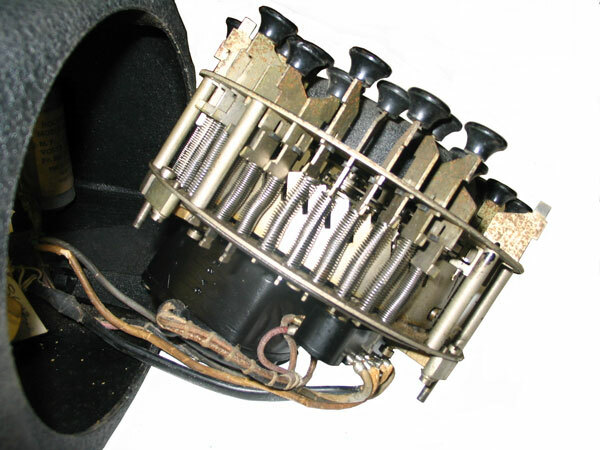 One such system was the Model 36 Monopulse. "204. 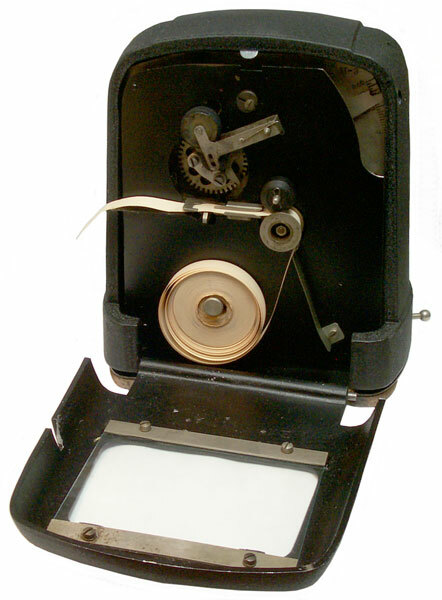 This operated much like some early stock tickers, with the line signal being an OPEN interval during which sending and receiving devices rotated until the proper point was reached for printing the desired character. the Keyboard, at the left here, had its Keys mounted in a circle, which was non-standard and took a bit of training by the operator. 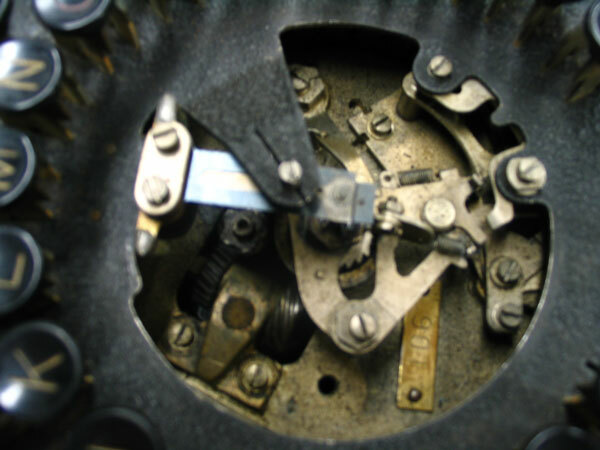 The sending contact was opened by depressing a key, and remained open until the selecting arm reached that key after leaving its rest of STOP position. "205. Meanwhile, the selecting arm at the receiving Printer was similarly seeking the printing point. When the line closed, it was there, so the printing hammer struck the rotating type wheel, printing the character. 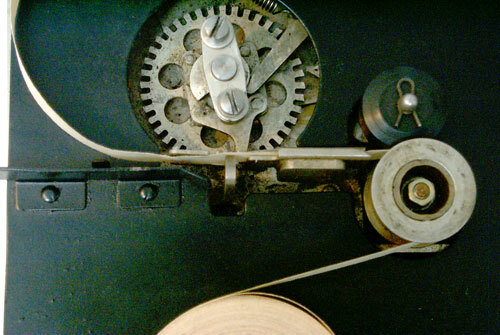 The Printer type wheel was inked, much as the old BLUE and GREEN code printers had been. 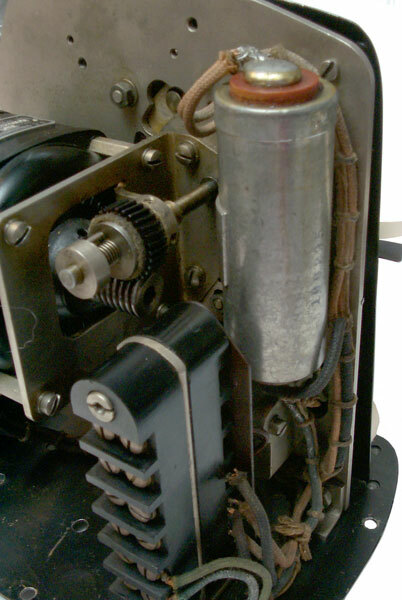 The inking roller can be seen at the top of the printer, with the type wheel under it. then comes the printing tape, the supply roll of which is at the bottom. 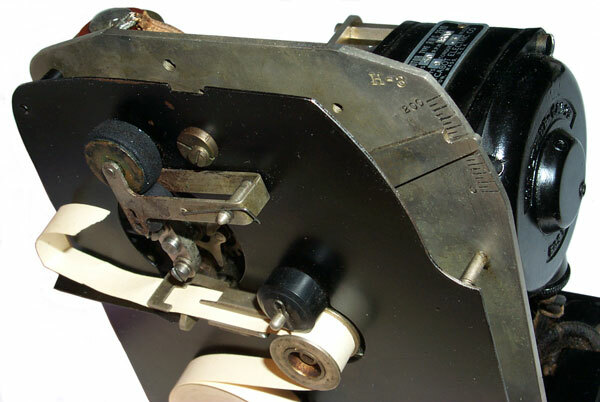 The printing hammer is just under the tape and print wheel, and moves upward to cause printing. 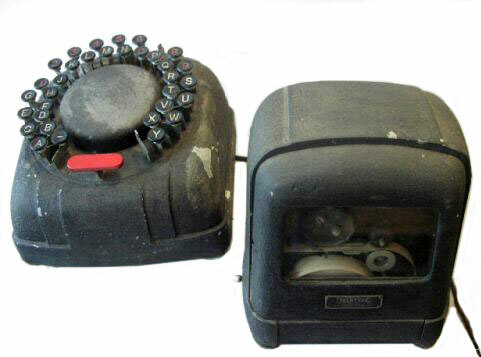 The system was very simple and therefore low cost, but only a limited number were made. " 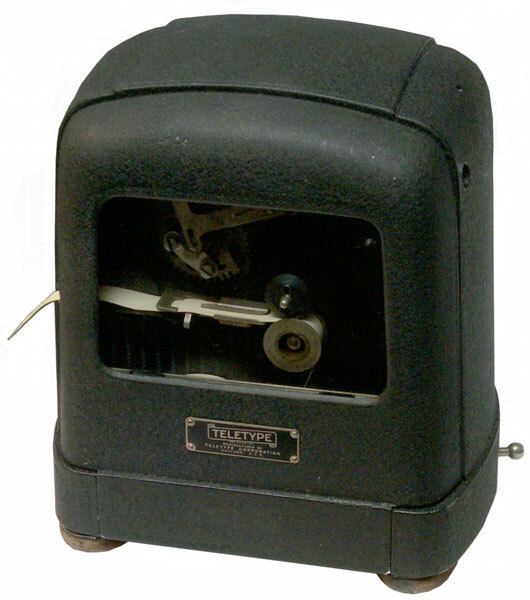 The early Baudot teleprinters held the selector with an electromagnet and at the start of a character released it allowing the selector to rotate. It makes sense that this printer used a very similar technique, except here the circle is divided into 26 letters and 9 numbers (letter O doubles as the number zero). The time when there's no current determines which character is going to be printed. 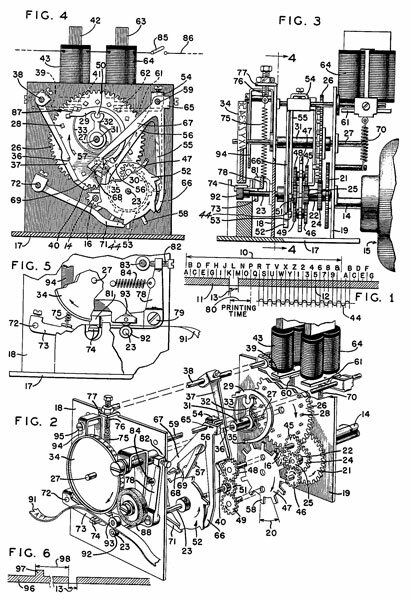 When the line is again connected the electromagnet is activated (causing the print hammer to strike) and when the transmitter and printer get to top dead center the rotation stops, ready for the next character. [an error occurred while processing this directive] page created 17 Nov 2009.